Tramex MRH III - non-destructive moisture detector for wood, roofing, drywall, plaster, tiles & brick. 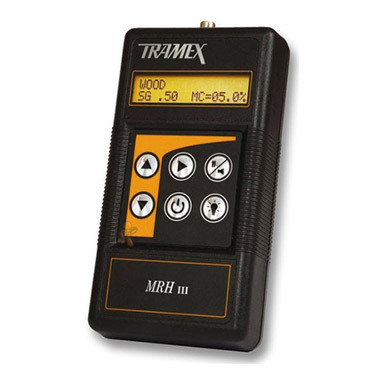 Tramex MRH is the digital display version of the popular Tramex Moisture Encounter Plus MEP moisture meter. Optional plug-in probes are available for measuring wood moisture levels (ref: HH14TP30) and relative humidity (ref: RHP-B). This Tramex moisture meter is completely non-destructive and utilises electrodes mounted on the base, which transmit low-frequency signals into the materials under test. To carry out moisture tests simply press the MRH firmly against the surface being tested. There is no surface damage and the reading is immediate. The MRH meter has 5 different scales: wood, roofing, masonry, drywall & laminate. Optional plug-in humidity probe available (ref: RHP-B) for relative humidity, temperature, dew-point and mixing ratio readings. Specific gravity adjustment for most wood species . Deep signal penetration of over 1" into the materials being tested without the need to damage the surface. Large, clear, easy to read digital display. Hold function enables the user to "freeze" the reading. Useful for taking readings when the meter face is not visible. Audible warning tone that can be switched off. Automatic power cut-off when not in use. Automatically defaults to last user setting when switched back on.